Holi the festival of colors calls for new beginnings. 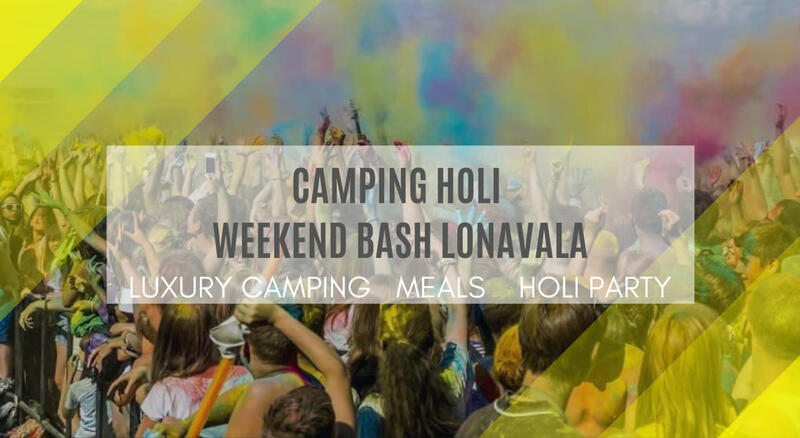 Spend your Holi by experiencing wonderful jungle outdoor camping at Lonavala Campout Holi Weekend Bash 2019. Jungle Camps offers a blissful atmosphere to celebrate this special occasion with your friends and family. An all-inclusive deal for Holi guarantees stay at a blissful and close to nature venue, unlimited food, great combination of Plug and Play and live acoustic music, a perfect way to spend the festival of colors & good vibes. At Campout Holi Party you can expect a leisurely camping weekend along with lip-smacking local food, live acoustic music. Enjoy the joys of being in nature without compromising on facilities like luxury tents with washroom, electricity and proper built washrooms to relish a curated glamping experience. Live Acoustic Music Performance on Day 1. Usage of board games and activities like archery, darts. 2 Person Alpine camping tents available on request at extra cost and on pre booking.